Abortion Rights launched the 40th anniversary campaign ahead of international Women’s Day in March with a rally and press conference with MPs, journalists, trade union leaders and supporters. Abortion Rights and the Joseph Rowntree Reform Trust commissioned an opinion poll in March 2007, which showed that an overwhelming 77 per cent of people support a woman’s right to choose an abortion in the first three months of pregnancy. 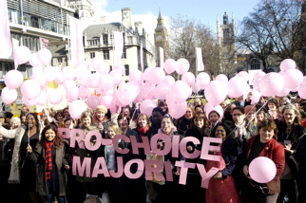 The poll confirms that pro-choice support remains as strong as ever, despite more than two years of anti-choice attacks. It also showed 73 per cent opposition to the delays that women often face when seeking an abortion. Only three per cent stated that ‘under no circumstances would it be acceptable to have an abortion’. Abortion Rights staged another successful string of events following our successful Pro-Choice Week of Action in October. On 22nd November, supporters of a woman’s right to choose from across Britain came together for a lobby of Parliament and rally to call for an end to the anti-choice offensive. The rally heard from leading medical professionals, commentators including Guardian Columnist Polly Toynbee, trade unionists, students, and MPs from all three major parties.